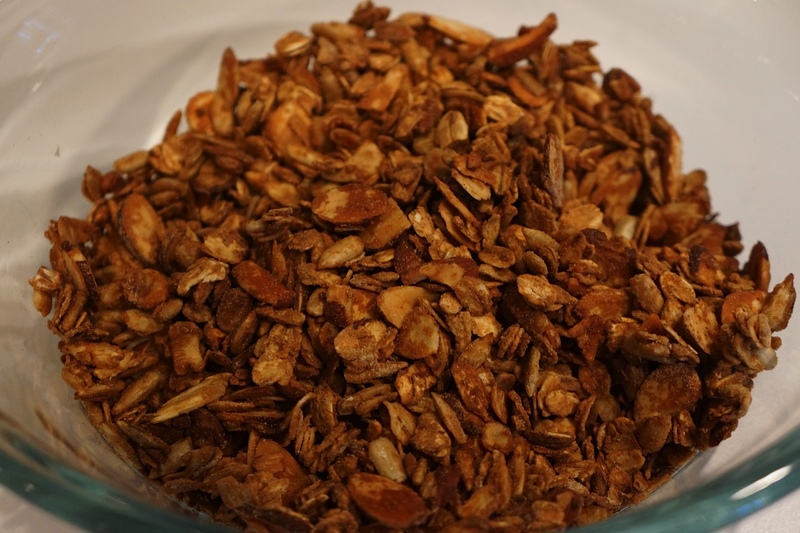 Our version of almond, sunflower seed granola inspired by the one at Blue State Coffee. 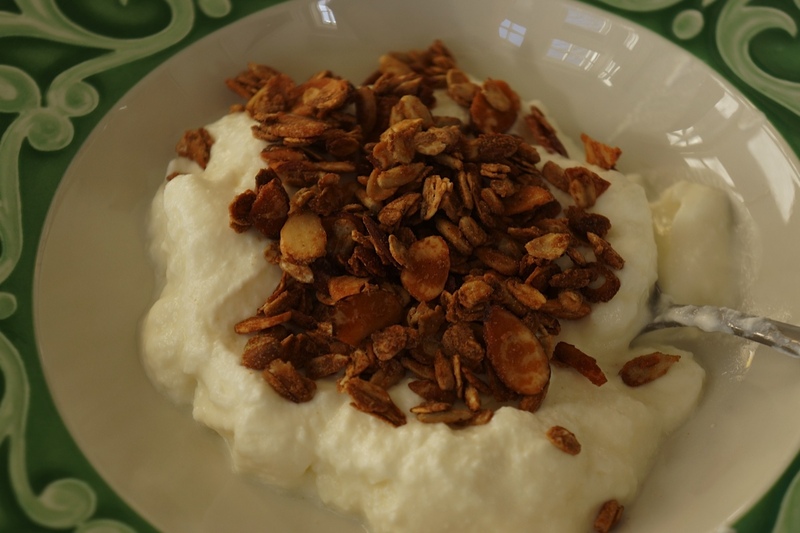 Narragansett Creamery yogurt topped with our granola. I’ve developed an addiction to Blue State Coffee’s house-made granola, but since they only sell it in small cupfuls, I decided it was time to take matters into our own hands. Last weekend, I bought the ingredients listed on the package and enlisted Geoff to create his own version. We wound up adding two ingredients not listed — a bit of oil to prevent it from sticking together and a small amount of chopped banana chips for sweetness. The results are impressively similar — ours is equally crunchy and has the same nutty flavor. The best part is that we can make it in large batches, so there’s plenty to share. I like it sprinkled on Narragansett Creamery Yogurt or Fage. I wonder if I can convince Geoff to make our own yogurt next. We spread the oats, almonds, sunflower seeds and chopped banana chips on a tray to get the balance we wanted first. Mix those in a bowl, sprinkle in some brown rice flower, a bit of agave nectar (or honey) and a small sprinkle of cinnamon. Mix in a bit of vegetable oil to prevent sticking. Spread it out on a cookie sheet and bake in the oven at 250 degrees until brown (basically until it matches the color of Blue State’s) or about 45 minutes. Let it dry on the tray until cool. Then, move to an airtight container to store. Note: Narragansett Creamery Yogurt can be purchased at the farmers’ markets or at Whole Foods Market. Blue State Coffee has two locations on Thayer Street in Providence — see www.bluestatecoffee.com.